The HP Color LaserJet CP3505x delivers the power and function you need to get bold, brilliant color and fine print quality. This printer helps to boost your productivity by delivering print speeds up to 22 ppm in black/white and color with 1200 x 600 dpi. You get your prints in less time with Instant-On technology and first page out at 12.5 seconds. The CP3505x was designed for ease of installtion and operation, connecting via USB and Fast Ethernet, so you can open the box and set up right away. The pre-installed HP toners provide rich, vibrant, reliable color for realistic photos and graphics with HP ColorSphere and Image REt 3600. You get the crisp, professional results you want with little waiting. A 850 sheet input capacity (optional 500 sheet tray boosts this to 850) gives you the freedom to load the paper, begin printing, and take care of other tasks. 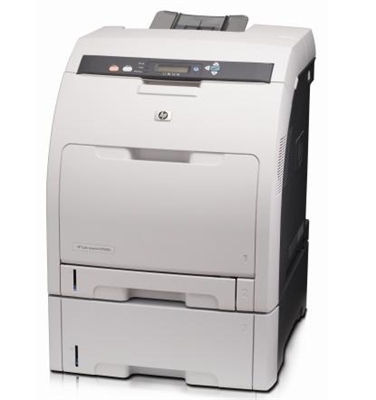 Automatic duplexing, an embedded HP Jetdirect Fast Ethernet print server, 384 MB (1 GB) RAM memory and 450 MHz processor help to round out this color laser printer's incredible performance. Custom: Multipurpose tray: 3 x 5 to 8.5 x 14"; 250-sheet and optional 500-sheet input trays: 5.8 x 8.3 to 8.5 x 14"